You can then throw yourself into the work, give your best and achieve the picture of success. Sometimes this will result in enjoying a feeling of positive exhaustion. There are different kinds of exhaustion. The positive kind results from doing things you believe in. You can then flow, focus, finish and, as a by-product, gain a sense of fulfillment. Whilst you may feel tired, you may also feel uplifted. The negative kind of exhaustion is experienced by people who do soul destroying work. They may work in organisations, for example, that treat them like cogs in a wheel. People leave work each day feeling tired and needing to heal their souls. Looking back, can you think of a time when you enjoyed a feeling of positive exhaustion? You may have been playing a sport, renovating a house, leading a team or doing some other activity. What did you do to follow your passion? 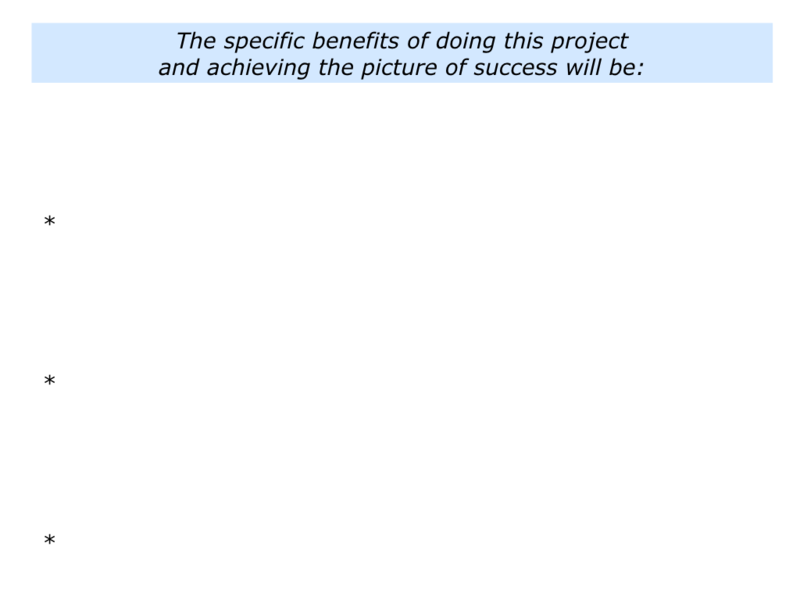 How did you translate this into a stimulating project? How did you then move into action? How did you continue to give your best? What happened as a result of achieving your goal? 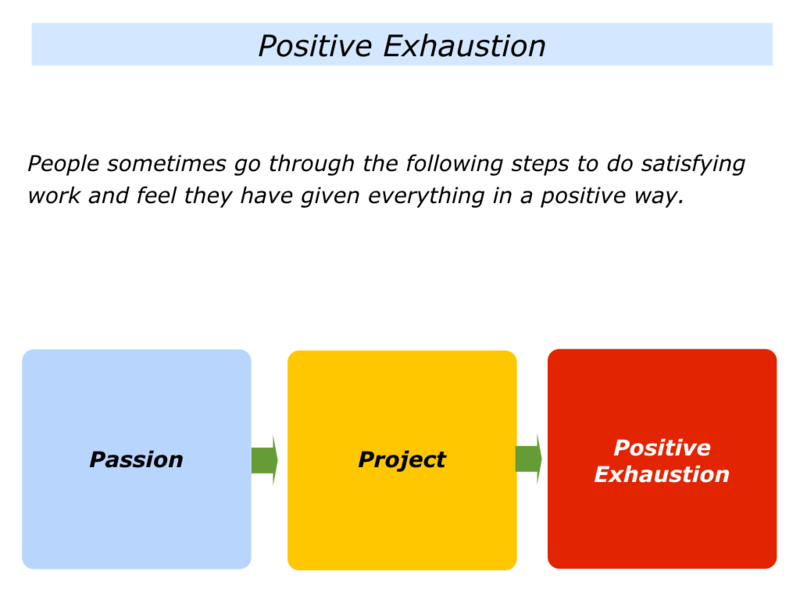 Describe a specific situation in the past when you followed a passion, translated it into a specific project and enjoyed a feeling of positive exhaustion. Describe the specific things you learned and gained from the experience. People sometimes want to simply enjoy life. On some occasions, however, they want to throw themselves into a specific activity and give everything. They may then emerge feeling tired but happy. Looking ahead, let’s explore how you may want to follow this path in the future. You may want to follow a passion in your personal or professional life. This may simply be an activity that brings you joy. You may want to pursue your love of writing, gardening, painting, singing, cooking or another activity. Looking at your professional life, you may want to pursue a passion in which you have the ability to achieve peak performance. You may want to tackle a specific challenge, build a successful prototype or whatever. What are the things I feel passionately about? What are the specific activities that give me positive energy, even when I think about them? They find the activity fascinating … They have a feeling for the activity and are good at it … They have a track record of finishing in the activity. Looking to the future, can you think of a specific passion you would like to pursue? Why would you like to pursue this passion? What might be the benefits for you and for other people? Describe a specific passion you would like to pursue. Describe the specific reasons why you would like to pursue this passion. Looking at your passion, how can you translate it into a specific project? Here are some steps that other people have taken. To write articles that inspire people … To create a website that helps people with a particular illness … To make YouTube films about people who have overcome setbacks … To organise a festival that showcases the work of local artists … To build a successful prototype that shows a better way of working. To help people to find satisfying work … To do a project that spreads kindness … To act as a mediator and help people to find solutions to conflicts … To write a book that enables people to make better decisions … To create a website that shows how human beings can build on what they have in common. You will have your own approach to translating your passion into a specific project. Imagine that you have taken this step. How stimulated do you feel to pursue your chosen project? Rate this on a scale 0 – 10. What can you do to maintain or improve the rating? What are the real results you want to achieve by doing the project? What will be the benefits for you and other people? What is your picture of success? Describe the specific project you want to do that will be an expression of your passion. 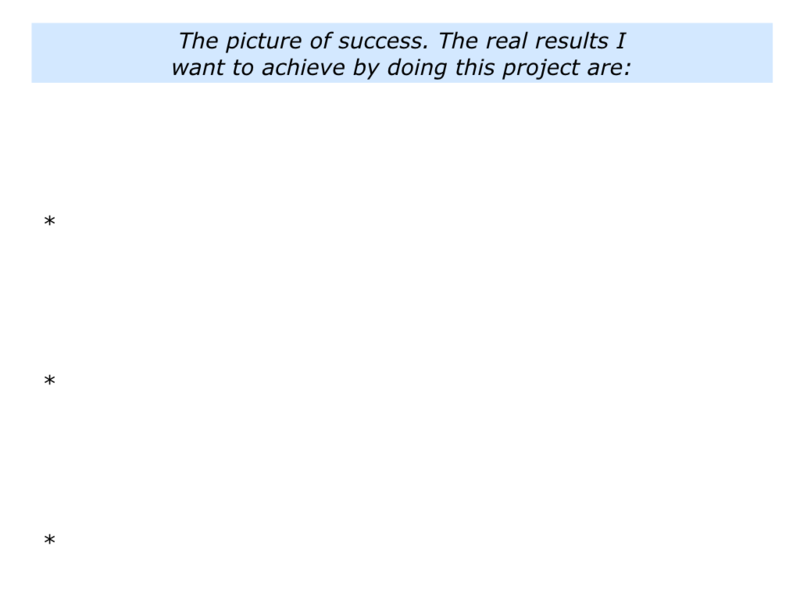 Describe the real results you want to achieve by doing the project – the picture of success. 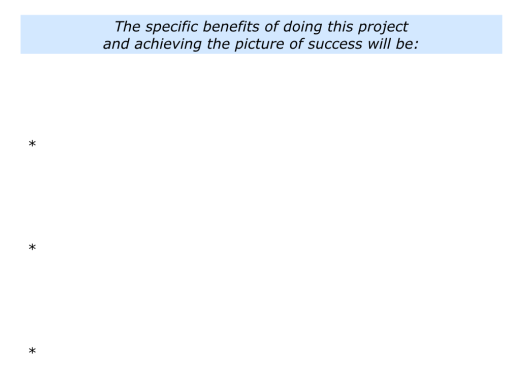 Describe the specific benefits of doing the project and achieving the picture of success. People who give their best to a project sometimes enter another dimension. They may experience their equivalent of going into the zone, the helper’s high or a state of flow. Looking back, when have you entered this state? What did you do right then to experience this feeling? People often mention pursuing the following principles. They do something they believe in … They build on their strengths … They set a specific goal … They keep focusing on the benefits of achieving the goal … They clarify the key strategies they want to follow to achieve the goal … They build in the support they need to do the job. They translate the strategies into specific action plans … They organise their time in blocks so they can concentrate properly … They follow rituals to prepare for doing the work … They rehearse what they are going to do … They keep following their daily disciplines … They set short term goals so they can get feelings of success. They get feedback and adjust their performance … They keep building on what works … They find solutions to challenges … They build in time for rest, reflection and re-centering … They become so absorbed in the task that time goes away … They keep going until they reach their goal … They sometimes experience a sense of elation. Let’s return to your passion and chosen project. Looking ahead, how can you do your best? How can you encourage yourself on the journey? How can you manage your energy? How can you build in ongoing successes? How can you perform superb work? How can you keep focusing on: a) What you are doing well; b) What you can do better and how? How can you do the basics and then add the brilliance? How can you add that touch of class? There are many ways to do fine work. One approach is to follow a passion and translate it into a specific project. 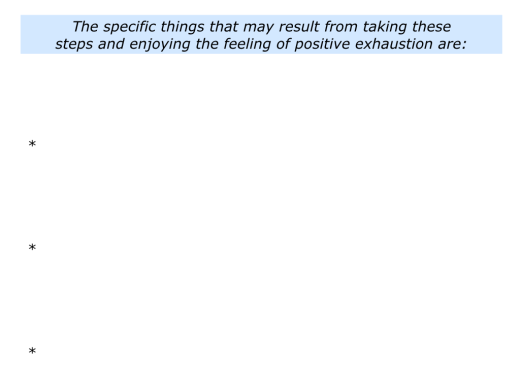 It is then to achieve successes and sometimes enjoy the feeling of positive exhaustion. Describe a specific project you want to do that will be an expression of your passion. Describe the specific things you can do to give your best to achieve the picture of success and perhaps enjoy a feeling of positive exhaustion.